how i add a world background with color and with a HDRI sky? i want to have a world bg with a grey or black color for example, but with a hdri sky lighting only, which means i only want to preview the bg color but not the image texture from the hdri, but i want to keep the lighting of that hdri... i dont want to use lamps instead which could be more easier but its not want i want...there is an option called transparent that appears in the film option in render tab, but it gets transparent obviously and it keeps the lighting, but i want to add color to it instead of transparency. 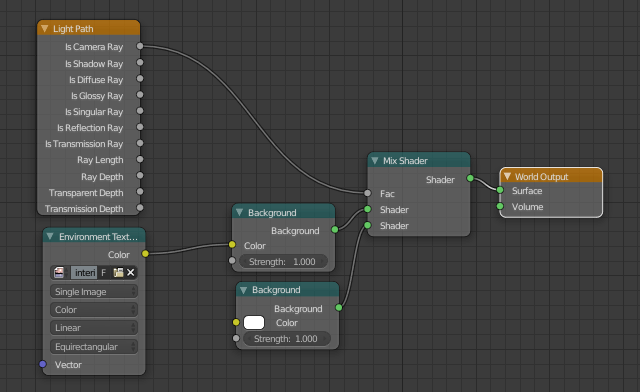 Ok here's a node setup in the world material that may solve your problem. Possible way to have a different background than the HDRI background? How to save a render image as JPEG with white background instead of default black background at alpha transparent areas? Hdri sky background too close? How to use a transparent material with mist in Blender Internal? How can I render pixel art images with no AA and transparent background?